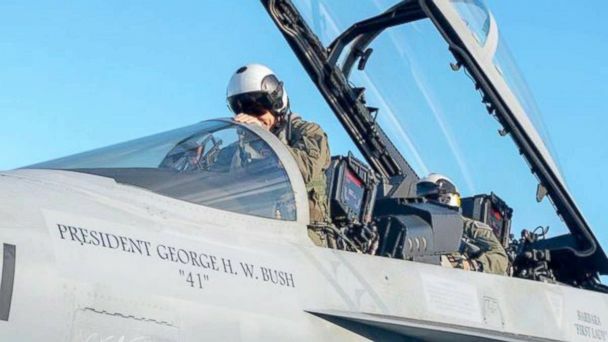 Twenty-one U.S. Navy fighter jets will conduct a flyover in the "missing man formation" in honor of President George H.W. Bush Thursday. The flyover will take place over the Bush Presidential Library in College Station, Texas, where the late president will be buried in a private ceremony, Naval Air Forces Atlantic spokesperson Cmdr. David Hecht told ABC News. The missing man formation is an aerial salute performed for funerals and memorial events. A Twenty-one gun salute, a military honor typically reserved for future, former and current U.S. presidents, inspired the Navy to arrange 21 F-18 Hornets and Super Hornets for this flight. Bush turned 18 and joined the Navy -- a few months after the attack on Pearl Harbor -- becoming one of the youngest naval aviators. His plane was shot down in 1944 during an operation to attack Japanese installations in the Pacific, but he would complete 58 combat missions in total during his military career and receive the Distinguished Flying Cross, among other medals. "Being selected to participate in this memorial is one of the highest honors a Naval Aviator can receive," Rear Adm. Roy Kelley, commander of Naval Air Force Atlantic, said in a statement. "In addition to being our president, [Bush] was also one of our brothers, flying combat missions off aircraft carriers during World War II. His service to our Navy and nation merits a tribute of this magnitude." The flyover will be led by Navy Capt. Kevin (call sign "Proton") McLaughlin, commodore of Strike Fighter Wing Atlantic, Hecht said. The left front side of McLaughlin's two-seater jet reads "President George H.W. Bush" and "41." The words "Barbara First Lady" -- after Bush's late wife Barbara Bush -- are just outside the second seat where the weapons officer would sit. The jets, which flew to Dallas this week, come from Naval Air Station Oceana in Virginia Beach, Virginia. Some of the jets are attached to Carrier Air Wing 8, which support the aircraft carrier USS George H.W. Bush, homeported in neighboring Norfolk, Virginia. Sailors aboard the USS George H.W. Bush used their flashlights to spell out a tribute and posted it on Instagram. The link between the late president and the aircraft carrier that bears his name was so strong that all of the previous commanding officers of the carrier have participated in the funeral ceremonies in Washington as honorary pallbearers. Bush attended the carrier's commissioning in 2009 and delivered the keynote address. Over the years, he made additional visits with members of his family. ABC News' Luis Martinez contributed to this report.